On May 12, 1863, Grant made his headquarters here at Dillon's Farm with Sherman's XV Corps. At Raymond, five and a half miles east along Fourteenmile Creek, McPherson's XVII Corps, with 12,000 men, defeated 3,000 Confederates under John Gregg. Grant heard the guns at Raymond and at sundown learned that McPherson was victorious. 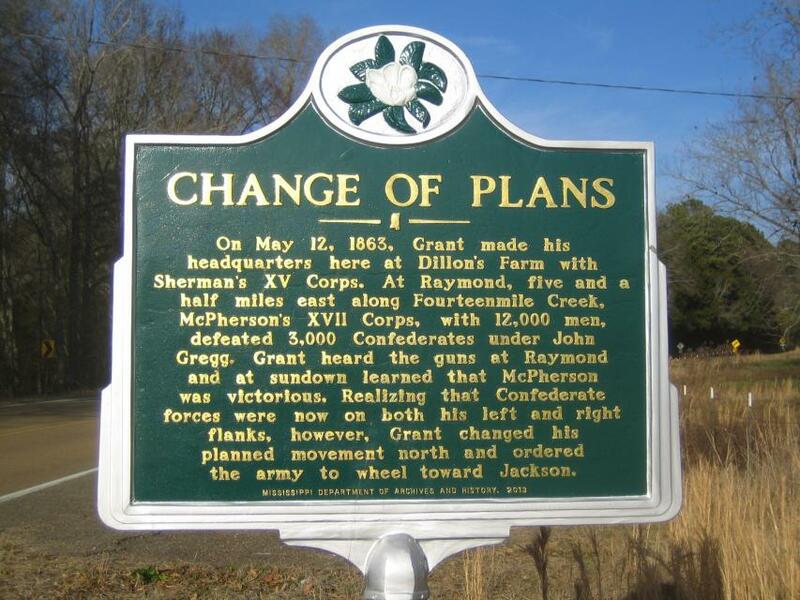 Realizing that Confederate forces were now on both his left and right flanks, however, Grant changed his planned movement north and ordered the army to wheel toward Jackson. This marker can also be identified by its HM code. You can use the hashtag #HM1ISH in tweets, and any other place where you might refer to this marker, including when searching on this site.